After getting our drink on at the Focus Wales drink reception, I left Carrie to catch two Welsh acts before running down nearly to the other end of the busy part of East 6th Street, ending up at the very colourful Esther’s Follies for my first visit in 7 years. In its normal, non-SXSW form, the place puts on comedy and vaudeville shows. As you should expect, there’s theatre-type seating in this venue, which offers the unique opportunity for a photographer to get real close to the artists while the rest of the audience, well, is comfortably seated and a good distance away from the stage. 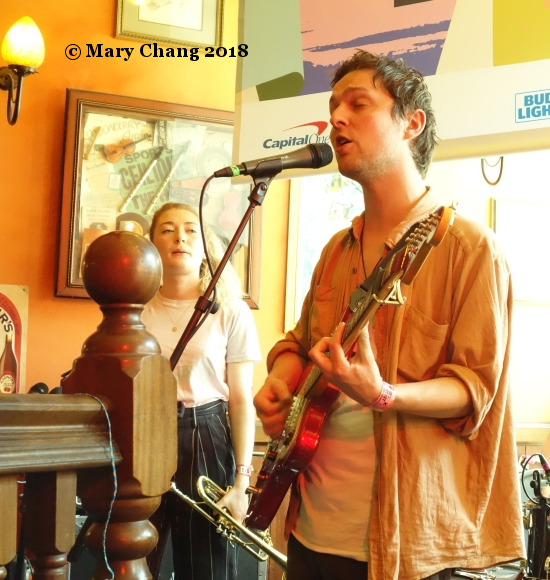 The 8 PM slot isn’t always a great one at SXSW 2018, but it worked out wonderfully for Austrian duo Leyya and their live band. I featured them in one of four preview write-ups I did for the Music Bloggers Guide to SXSW 2018. 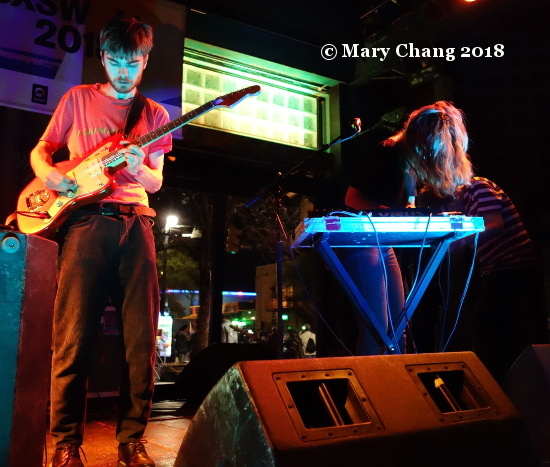 Even though they were classed in the avant / experimental genre in this year’s SXSW schedule, in reality what Sophie Lindinger and Marco Kleebauer are doing is putting together the best bits of pop, soul, electronic and percussive music. This is music designed to get your body moving and grooving but without the pretension of intellectual electronic but with more bite and presence than the average pop band. They’re exactly the kind of act who make me excited about the future of music: artists who are willing to take chances, stepping out of the mainstream box and trying something different, with amazing results. My only wish for their performance was to have more people swinging their partners to and fro to their music! I got hung up at Esther’s Follies for longer than I expected – I indulged a Leyya superfan and took a photo of her and Sophie after their set – so I decided a nice saunter over to the Waller Ballroom was better than trying to rush off somewhere else. The Waller Ballroom was Dutch New Wave’s venue for the week, having an indoor space plus a nice biergarden outside. I’m sure it was something else previously, but the door staff couldn’t tell me what it used to be. Once inside, I was surprised by the weird, rectangular shape of the room, the stage more than twice as long as the room’s depth. It made for strange options for photography, that’s for sure. A parade of white and black Dutch people came through the doors after I arrived, talking up a storm, slapping each other on the back. While I couldn’t understand what they were saying, it was clear they showed up to provide support to their friends The Homesick from Dokkum. Living in a country so divided by race like ours, such a simple thing between friends was heartwarming to me. Then it was time for the band to take the stage. 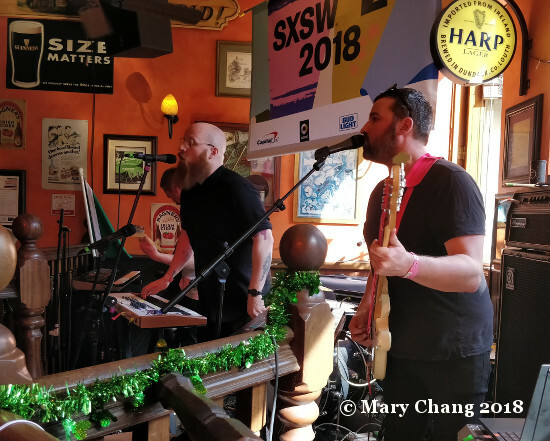 While going through all the bands scheduled to appear in Austin from the Continent, The Homesick were in my top five bands I definitely wanted to see. They’re a young band, but they’ve already figured out how to write a compelling song, compelling in the sense that their songwriting captures your imagination and keeps you wanting more. The driving guitars and drumbeats in their rock songs are simultaneously weird and wonderful. Watching Elias Elgersma wail on his guitar with awe-inspiring dexterity, I realised I was experiencing something special indeed. 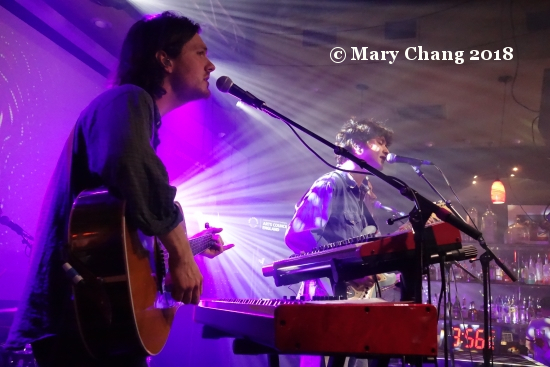 Read my preview of their appearance in Austin through here. 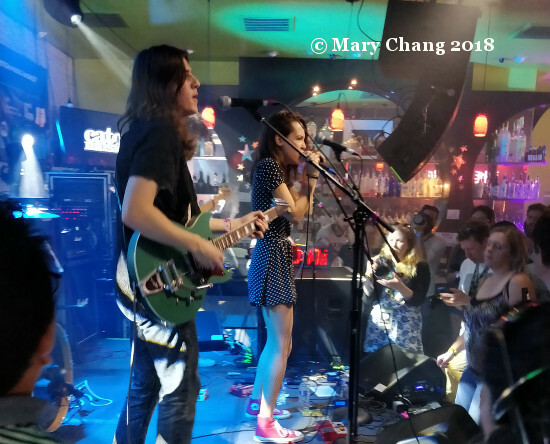 Having gotten an appropriate Homesick fix, I intended to catch American duo Bat Fangs at Barracuda’s indoor stage as part of the Ground Control Touring showcase there. Oddly, my press pass didn’t let me in. Rebuffed, instead of waiting, I thought I’d just go around the corner to the 720 Club and wait for The RPMs to start their set. 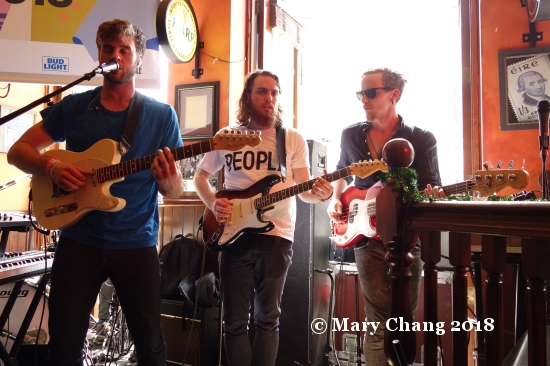 Brighton’s newest hope for the next big British guitar band were setting up in the hole in the wall club. Which I mean quite literally. The band are a five-piece and only the keyboardist and drummer could fit on the stage. This was definitely an opportunity to get up close and personal with your musical idols! Although the rough and tumble nature of the venue seemed more appropriate for a punk band, the RPMs filled the room with their brand of glittery synthpop and rock and this show, along with their appearance at the British Music Embassy Friday afternoon, showed they have loads of potential to be as big as their own influences. 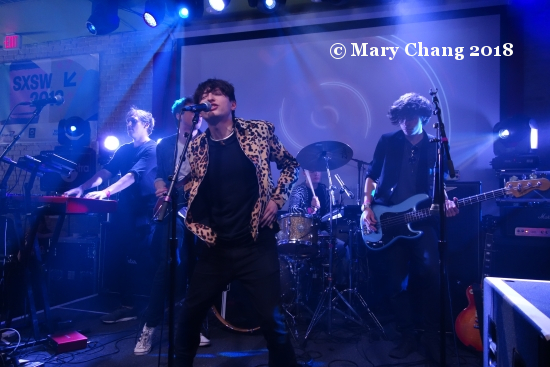 Read my SXSW 2018 preview piece on The RPMs through here. As you can see, the stage was brightly lit at the 720 Club, but the floor wasn’t. Then it was time to pop back to the British Music Embassy. I didn’t need to see Frank Turner there, as I knew uber fan Carrie would catch him during the week some point. However, I did want to get into Latitude 30 early enough for Sam Fender and not have to jockey for a good position to see him and his band playing. As you might imagine, Frank Turner was a huge draw for Brits and Americans alike, so the place was one in, one out when I arrived. I’m not sure why this hadn’t occurred to Latitude 30 staff until that moment – maybe it was because it had been unseasonably cold in Austin since we arrived? – but they decided that night to open up the windows so those in the queues could hear Turner play. He ended his set with a rousing version of ‘Polaroid Picture’ that had nearly everyone inside and outside singing along. I recognised the song but not knowing the words, I just bobbed my head to the beat. Good enough, right? For more photos from my Wednesday at SXSW 2018, visit my Flickr. Another year, another chance for us music journos to guess who will be the next great British guitar band. Following SXSW 2016 alums The Sherlocks’ ill-advised Y Not poster Photoshopping stunt, the field is again wide open. 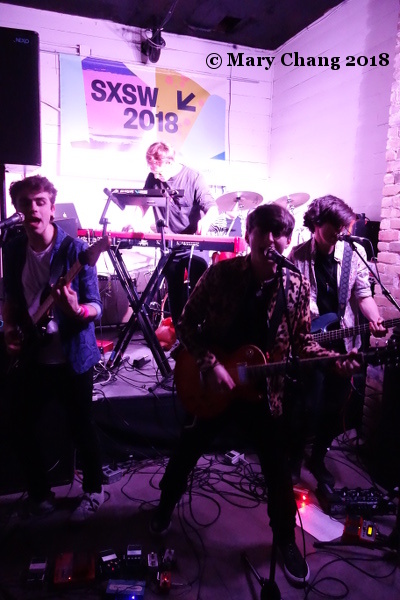 Brighton band The RPMs are the latest hopefuls to get the nod from BBC Radio 1’s Huw Stephens and 6 Music’s Chris Hawkins, Steve Lamacq, and Tom Robinson, as well as Radio X’s John Kennedy. 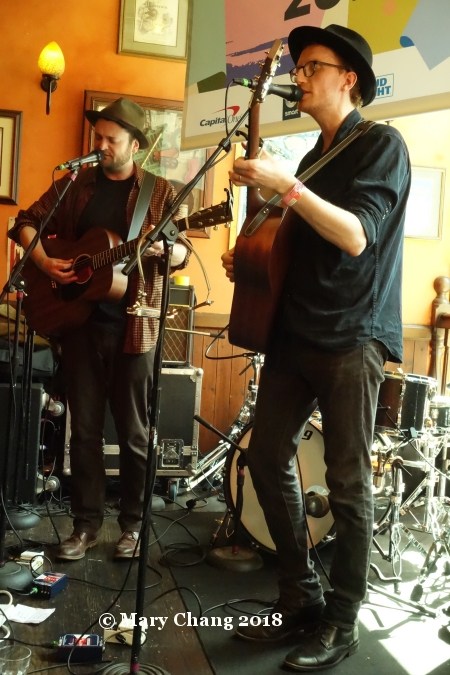 They’re signed to Xtra Mile Recordings, also home to Frank Turner (making his umpteenth appearance in Austin next month) and Skinny Lister. They’ve also already been announced for Live at Leeds, Liverpool Sound City and Stockton Calling, just the beginning to what I would expect to be a pretty full calendar for 2018 for the group. Along with fellow Brighton band Yonaka who are also making their way to Austin, The RPMs are part of a growing scene by the sea on England’s south coast, proving you don’t have to decamp to London to be noticed. Like many other young bands who skirt the line between pop and rock, their coming of age in this increasingly puzzling and disenchanting world we live in figures prominently in their music. Their 2016 EP ‘Digital Disobedience’ includes the foot-stomper ‘I Think It’s Stupid, But I Think It’s Love’ and ‘I Wanna Work at Abercrombie and Fitch’, continuing the strange trend of non-Americans wanting to be connected to something obviously American. 2017 EP ‘Agents of Change’ showed the group veering from pop into a more mainstream rock sound. ‘Oh My God’ sports an almost country rhythm, while ‘Help Me Start the Day’ has a more feel good rock-by-the-numbers kind of vibe. The RPMs’ upcoming single is conveniently scheduled to drop the Friday we’re all in Austin, on the 16th of March. ‘Your Ghost’ has more in common with a song from the Killers: its synthesiser notes and slick production make the band sound like veterans, not newbies on the British music scene. The RPMs say their biggest influence is Liverpool’s The La’s, citing ‘There She Goes’ as the song they wish they’d written, and they’ve already been compared to British alt-rock royalty Arctic Monkeys. 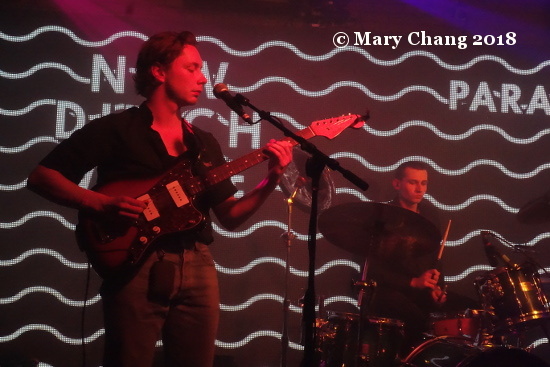 The reality of their music is somewhere in between: pop, all shiny and new for the young Radio 1 crowd, but with enough rock band potential that could spell mainstream success. I’ll be curious to see the reaction from Austin audiences to this latest rock band entry from England. As with all of the SXSW 2018 showcasing artists we feature here at TGTF, The RPMs’ appearance in Austin is subject to change. We recommend that you consult the official SXSW Music Festival schedule for the latest information and updates.